At the 17th America’s Cup Hall of Fame Induction Ceremony presented by Rolex on Saturday night at the New York Yacht Club in Newport, R.I., the inductees included BMW ORACLE Racing team members Mike Drummond and Murray Jones. 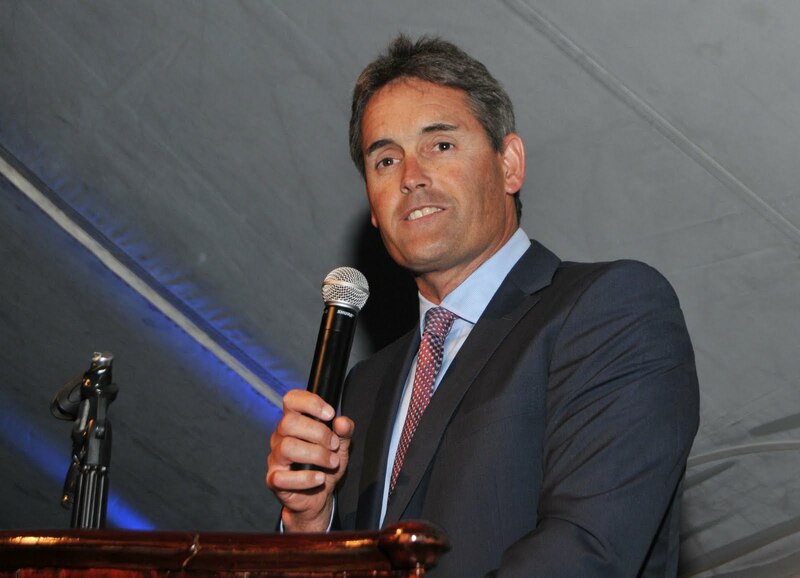 Drummond, the team’s design director, was welcomed to the Hall of Fame by team CEO Russell Coutts, who was inducted in 1996. The two worked together in Team New Zealand and were reunited in BMW ORACLE Racing for the 33rd Match. Jones, now a member of the team’s afterguard, was inducted along with fellow Kiwi legends Simon Daubney, Warwick Fleury and Dean Phipps. As a group they won four America’s Cup Matches from 1995 to 2007, posting a 20-2 record along the way. Famed New Zealand television commentator Peter Montgomery presented them to the hall, where they joined crewmates Coutts and Brad Butterworth (inducted in 2004). The Hall of Fame also welcomed Halsey Herreshoff of Bristol, R.I., to the hall. 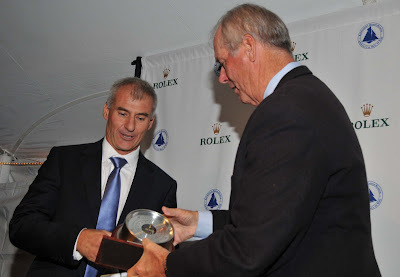 Herreshoff is distinguished as the most active America’s Cup sailor during the 12-Meter era, racing as a bowman, crew boss or navigator in six campaigns and four matches. A naval architect and marine engineer, Herreshoff is also the founder of the America’s Cup Hall of Fame along with the late Edward du Moulin. Below is Coutts’ presentation speech of Drummond. Ladies and gentlemen, members of the America's Cup Hall of Fame, good evening. Sometimes the art of selling can be better achieved by being subtle! Early on in Team New Zealand’s first defense campaign – in about 1997 – Mike left an A Class catamaran on my dock at Lake Pupuke on Auckland’s North Shore. “Why don’t you try sailing a real boat?” suggested Mike. And some 13 years later, we have multihulls in the America’s Cup. No doubt multihulls were on Mike’s mind back then, but I can assure you, not many others were thinking that way! In fact, let’s roll the clock back, to December 2007, when it became obvious a multihull contest was inevitable. I can tell you, there were some very glum faces in our team, especially among the monohull specialists. But one face had enthusiasm written all over it – that was Mike’s. Because behind his modest, quiet demeanour is an incredibly innovative person who loves the idea ... of ideas! The criss-cross rigging system which every team adopted. The Hula – and you’ve got to say that making an entire false hull covering a quarter of the boat and getting the measurers to call it an appendage was some kind of genius! And, of course, Mike was “The” big proponent of the 68-meter wingsail which we used in the last Cup. And boy, did he have to do some selling to get that idea accepted! In fact, considering “all” the important choices during our last campaign, Mike was right on all the key concepts, all the way through. In any America’s Cup campaign, especially a new and difficult one, people with such ability are like gold. Often, it’s the skippers and sailors who get the attention, but all of us know just how vital design is. So that’s why I’m particularly delighted to see Mike get this recognition. Also, because he has helped more than a few of us here win on the water. All of us who have worked with Mike know he has never been one to talk up his own achievements. Yet he has won four America’s Cups – two with Team New Zealand, Alinghi and most recently BMW ORACLE Racing. In 1995, Tom Schnackenberg said Mike’s contribution was three times what anyone outside the team realised. In 2000, Mike was recognized as a key decision maker in the design team and navigated in two races. And when you talk to people about Mike, and what has gone into his level of achievement, a few themes always emerge. One is just how incredibly smart he is. It amazes me how Mike can effortlessly crunch complex mathematical calculations in his head – while keeping up with the flow of a meeting at the same time. Yes, Mike, I know I’m starting to embarrass you. But don’t worry; I’m just warming-up. And the third thing is determination. As a 9-year-old, Mike started racing at the Glendowie Boating Club in Auckland. He progressed from P-class to Flying Ants, racing up and down the Tamaki River with a lot of success before moving up to 470s. A pretty good source told me that at the end of one regatta Mike finished just one point behind Chris Dickson. His parents were trying to console him saying 2nd was still good. So Mike had the America’s Cup in his veins even then. Then, like a lot of us back then, Mike came into the America’s Cup by accident. Which I guess is a happy or an unhappy occurrence depending on your point of view! The first he heard about New Zealand’s first Cup challenge was when he read about it in a yachting magazine. This was in the mid-eighties – Mike was working on a synthetic fuel plant New Zealand was building in response to an oil crisis. So, a little later, Mike, aged 22, rocked-up to an Auckland boatyard. There, under a tent, and without any security whatsoever, was the mold for the first-ever fiberglass America’s Cup boat. As I understand it, Russell Bowler (of Farr Yacht Design) then proceeded to interview Mike rigorously. And remember, Mike had only ever sailed small dinghies at this stage. And so, at $15 a day, Mike had his first job in the America’s Cup! Back then of course most New Zealanders had never seen a large keel boat, let alone sailed one. Pretty well everything had to be approached starting from complete basics. And it is Mike’s exceptional ability to do just this that has brought him to where he is in the Cup today. As I’ve already said, during the last campaign he was the first to lead us very strongly towards the wing. Most people accepted that it should ultimately prove superior, but at the time it was a huge decision and carried an enormous risk. And it’s in a situation like that when you need someone who can apply a lot of knowledge across the many different areas of the boat. Mike, you may have not expected to find yourself here tonight. But believe me none of your peers are surprised. The boats you have helped create are clearly some of the most innovative in the history of the Cup. It’s an honor to be here tonight, to congratulate you on a distinction you so richly deserve. Well done Mike. And well done Simon, Warwick, Deano and Murray – it’s been a very, very fun ride!